Betty Ann Verheyn can't afford the Gulf Breeze home her late husband left her and is on the verge of leaving it. Leona Zarr moved out of her Pensacola home after a higher adjustable mortgage rate kicked in. when their rented home in Montclair was foreclosed upon. Steve Bodiford of Niceville struggles to keep rental homes in East Hill and Destin. 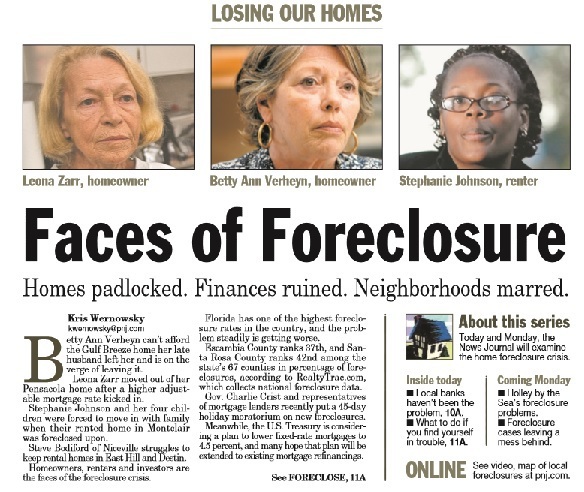 Homeowners, renters and investors are the faces of the foreclosure crisis. Florida has one of the highest foreclosure rates in the country, and the problem steadily is getting worse. Escambia County ranks 37th, and Santa Rosa County ranks 42nd among the state's 67 counties in percentage of foreclosures, according to RealtyTrac.com, which collects national foreclosure data. Gov. Charlie Crist and representatives of mortgage lenders recently put a 45-day holiday moratorium on new foreclosures. Meanwhile, the U.S. Treasury is considering a plan to lower fixed-rate mortgages to 4.5 percent, and many hope that plan will be extended to existing mortgage refinancings. But in mid-January, when the moratorium is over, local real estate experts say there's every likelihood of a tidal wave of new foreclosures. "It's safe to say the pace of foreclosures will not abate for probably another 12 months," said Rick Harper, an economist at the Haas Center for Business Research and Economic Development at the University of West Florida. * In Escambia County, 724 foreclosure suits were filed in 2005. In the first 11 months of this year, 2,248 were filed. * In Santa Rosa County, 292 suits were filed in 2005. Through November of this year, 1,332 had been filed. * Last month, 196 homes in Escambia County sold. Meanwhile, 120 homes went into foreclosure proceedings. * Family Promise of Santa Rosa, a nonprofit organization that provides housing assistance, reported one instance of a renter displaced by foreclosure in 2006. Now, the organization gets at least three requests a month from displaced renters, said director Debbie Laird. Foreclosures hurt the whole community, not just those foreclosed upon. "Foreclosures are a true barometer of what's going on in the overall economy," said Al Muller, co-owner of Metro Market Trends Inc., which collects local housing data. The Pensacola Realtors Association currently lists about 6,200 homes on the market in Escambia and parts of Santa Rosa, well above the average of about 4,200. "For Sale" signs are popping up and staying up, and foreclosures are no small part of the reason why. Blame the miserable economy. Blame Hurricane Ivan in 2004 and Hurricane Dennis in 2005. Blame a mortgage lending industry that ran amok. Florida's foreclosure crisis began with unprecedented condominium development in the southern and central parts of the state after the turn of the century. Northwest Florida was somewhat insulated because the local economy is less dependent on tourism, and the buying frenzy of investors never completely materialized here, Harper said. "There wasn't as much of an expectation of a price gain here, so people didn't get as far in over their heads," he said. But Ivan and Dennis destroyed thousands of homes and condominiums, causing a dramatic rise in the price of remaining inventory. When the housing shortage eventually tapered off, a surplus of overvalued homes remained. "Most people who bought homes back in 2005 and 2006 often bought with little or no money down and stretched to purchase," Muller said. "As soon as they fell behind on the mortgage or when the property value declined, there wasn't a lot of a cushion to allow them to hold on." With the economic collapse of the past couple of years, the situation is worsening. People are losing their jobs at the same time that prices in general are spiraling. "The profile of someone who is going to be hurt is a two-income family. Then, one or the other loses their job," Harper said. "All of a sudden, they are within one or two months of not being able to pay their mortgage." Many of those people shouldn't have gotten mortgages in the first place. Mortgage companies set up on a whim and a prayer made numerous subprime loans to people who were less than credit-worthy. Joseph Woodall of Gulf Breeze, president of America's Mortgage Experts and vice president of the Florida Mortgage Brokers Association, estimates that about 15 mortgage companies in Escambia and Santa Rosa counties have closed in the past year. "You had green, greedy brokers that had no clue what they were doing who were trying to burn and churn files," Woodall said. Loans were going to anyone and everyone, with no checks on financial stability, said Muller of Metro Market Trends. money. We're easy,' " he said. Behind every foreclosure, there's a story of lives changed and finances gone awry. Betty Ann Verheyn, 60, and her husband, David, remodeled their home after Ivan in hopes of raising its value, then selling it. But, with the housing market crash, they were unable to sell. Verheyn's husband died in March of this year. She hasn't made a mortgage payment since. A foreclosure suit filed by JP Morgan Chase Bank is pending. Her home sits on the market for $589,000, one of three for sale on her street. Even if Verheyn sells, she's not certain she'll get enough to cover what she owes from the remodeling. If she doesn't sell, she'll probably have to let the foreclosure go through. "I don't know what else I can do. I don't want to just walk away," she said. "I'm hoping and praying." If she loses her home, she said, she'll probably move to her son's home in Gainesville. Leona Zarr, 72, refinanced her home on Newton Drive, off Scenic Highway, several years ago. She had an adjustable rate mortgage, and when her higher monthly payment kicked in last year, she no longer could afford to pay. When an Escambia County sheriff's deputy came to her home on Nov. 4, it was hardly a surprise. She had two days to get out and nowhere to go. "I had been looking for a place, but it's not easy," she said. Zarr found a rental home in Montclair. But after the security deposit and first month's rent, there wasn't enough left over to turn on the electricity or water. "I can't pay most of the bills," she said. "I need help just to get my feet back on the ground." She expects her son will have to come live with her and help her cover future rent and expenses. RealtyTrac reports that 30 percent of properties in the foreclosure process are owned by someone with a different address, indicating the home likely is owned by an investor. rough water, often so does the renter. Stephanie Johnson, 35, a single mother with four young children, was blindsided by the foreclosure suit against her landlord. Aug. 4 to the sound of banging at her door. The process server on the porch handed her papers saying the house she had rented for 10 months in the Montclair neighborhood was headed into foreclosure. "That was a sad day. It was pretty embarrassing," Johnson said. "Me and my kids didn't have anywhere to go." Johnson had only a day to move. She and her children moved to the Loaves & Fishes homeless shelter. A month later, they moved in with relatives. Johnson is working two jobs now, in the kitchen of Escambia County Jail and at a Kentucky Fried Chicken, trying to raise money for a security deposit and the first month's rent for a new dwelling. Johnson's landlord, real estate agent Cosmo Spellings of Crestview, said he's about $500,000 in debt. He said he fell behind on his monthly payments for the Montclair house when it was empty for a few months. After Johnson moved in, the bank raised his payments to cover the ones he missed. "My sole source of income is real estate," Spellings said. "When you aren't making the money in real estate to pay the extra mortgage, do you put gas in the car and food on the table to feed your kid, or do you hold onto these properties?" Steve Bodiford, who bought houses in East Hill and Destin, said he hoped to keep the houses for a couple of years, sell them and make about $50,000 profit. "There was a time when I could afford to make the payments, and my hopes were to make a little bit of money, but literally as soon as I closed on both of those houses in the spring and summer of 2006, it just changed," he said. The Destin home, purchased for $330,000, is now worth about half of that, he said. He hasn't made a mortgage payment since last November, and LaSalle Bank National Association filed a foreclosure suit. "The one in Destin I am letting go," he said. He's trying to negotiate with his lender to keep the East Hill house. The nation's economic recovery must begin with the housing market, experts agree. Buzz Ritchie, president of Gulf Coat Community Bank, is convinced a stronger economy is coming. He said increased military spending bodes well for Northwest Florida as do growing companies like Navy Federal Credit Union. "This thing is so big, but it will correct itself," Ritchie said. "I have been through these cycles, and I've seen these bad days. We'll grow our way out of this." Mike Gilmore, owner of Tara Mortgage in Pensacola, believes time will heal economic wounds. "One of the biggest problems we have right now is people are stuck," he said. "People are fearful of doing anything that might create more problems. They are pulling back on household expenses, vacations and other unnecessary expenses. Housing just affects so many things."